Polymeric Foams Structure–Property–Performance: A Design Guide is a response to the design challenges faced by engineers in a growing market with evolving standards, new regulations, and an ever-increasing variety of application types for polymeric foam. 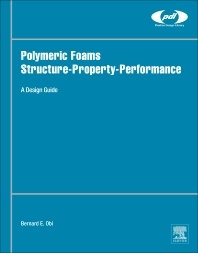 Bernard Obi, an author with wide experience in testing, characterizing, and applying polymer foams, approaches this emerging complexity with a practical design methodology that focuses on understanding the relationship between structure–properties of polymeric foams and their performance attributes. The book not only introduces the fundamentals of polymer and foam science and engineering, but also goes more in-depth, covering foam processing, properties, and uses for a variety of applications. By connecting the diverse technologies of polymer science to those from foam science, and by linking both micro- and macrostructure–property relationships to key performance attributes, the book gives engineers the information required to solve pressing design problems involving the use of polymeric foams and to optimize foam performance. With a focus on applications in the automotive and transportation industries, as well as uses of foams in structural composites for lightweight applications, the author provides numerous case studies and design examples of real-life industrial problems from various industries and their solutions. Dr. Bernard E. Obi began his career in 1985 at The Dow Chemical Company and retired after 30 years of service. He worked as senior research scientist in various capacities in research and development throughout his years of service with Dow. He obtained degrees in chemistry and chemical engineering. He received his Ph.D. in chemical engineering from Michigan State University. Formerly Senior Research Scientist, The Dow Chemical Company, USA.